I called my brother up today to let him know I was driving a car that probably wasn't worth as much as the cell phone that I was speaking to him on. He laughed and knew immediately I was driving The Roach. And we both knew I was lying. A) Because even a running car is worth at least a few hundred bucks and . . .
B) Because The Roach is priceless as far as we're concerned. 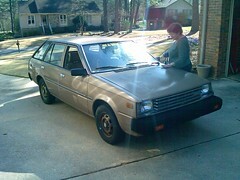 Our parents bought this brown Datsun (the Nissan name was just getting phased in at that time) Sentra wagon back when it was brand new in 1982. So for my brother and I, the car has been a part of the family for most of our lives. Barreling down the interstate sitting in the cargo area (who cared about safety back then) pretending to launch torpedoes at the cars behind us. Riding to swimming lessons at the YMCA listening to early 80s 'yacht rock' style pop music. Rolling through various fields and pastures surveying layouts for soccer fields. Learning to drive stick shift around the Rust office park and in the hills of Old Weatherly. Performing my first push-start in college when I mistakenly left the lights on all day. The Roach saw a lot of use in the 80s. But as we approached our high school years, it started to assume the role of spare car for our household. Our parents each had newer vehicles and my brother and I (neither of us properly appreciating The Roach at that impressionable young age) each saved up and bought our own cars once we turned 16. All at once, the torrential pace at which it had been racking up the miles slowed to a crawl. Whenever one of our cars was in the shop (which was a lot for both our first cars/lemons) the Roach stepped up to the plate and fulfilled its duties admirably - even if we only begrudgingly accepted its aide at the time. But for the most part, it quietly sat to the side and watched our family go back and forth in other vehicles, only calling on it occasionally. Over the last decade or so, The Roach has spent a great deal of its time residing in the parking lot of a local mini-warehouse. Its been kept company by our parents motorhome, but these later years out in the sun quickly began to take their toll. The paint is now quite faded with much of the interior highly dry-rotted. The A/C is pretty much non-existent (although the fan still at least blows.) The rear windshield wiper has long since fallen off. The hydraulics on the hatchback are shot (although a golf club handle works quite nicely.) And the radio is long gone . . . not that the rotted original factory speakers are of use anyway. But the car itself still runs like a top. And for my starving musician brother, it once again stepped up the plate in recent years as a heavily-utilized relief vehicle by easing the burden of his old truck's poor mileage on his constant trips between Florence and Nashville. I've even used it myself a few times in recent years whenever my car was in the shop. Sadly though, The Roach is finally saying goodbye to our family. My parents have decided to donate it to a local charity. I know they see a lot of beat up old cars. Still, you always have a special bond when its YOURS. I hope whoever gets it will look past the faded paint and the crusty interior to see what still is (to me at least) a great little car. So, I pretty much have been on the verge of tears reading this blog. Literally, over a piece of old rusty metal and combustion mechanics. I never really missed the Jeep, nor the truck or the Camry. But the Roach, was the best car and the most reliable thats ever been in our family. In a way we both took it on its farewell journey. I dove it all the way from Florence, to B'ham for Jessie's birth. I knew the car needed to come home and since Erin would be driving down seperate it was a good opportunity. So after returning from a gig at 1:00am in Memphis, I steered it south. I could only max out at 55 before the car started shaking violently. After all it was still on its original shocks and the ball bearings were basically gone. So the trip took a mere 4 hours instead of 2. But it was worth it. Crazy how I'm gonna miss that car.